Whether you are travelling solo, on business, with friends or on holiday with family our 28sqm Urban and Poolside rooms have been thoughtfully designed to ensure you get the most out of your trip. Urban and Poolside rooms feature your choice of views based on your preference of Melbourne’s bustling streets or our beautiful pool area. We also offer the option of interconnecting rooms which add flexibility to accommodate larger families or group travelers. Admire the Melbourne view from your floor to ceiling windows or enjoy the option of complete blackout or sheer coverage that electric blackout blinds provide, with the added convenience of controlling the blinds from your bed. Spacious bathrooms make it a pleasure to get ready for a day out or a day in the office, with an over-sized shower and plenty of storage space for toiletries and any other items you may need. Our rooms also feature an alarm clock that charges smartphones, a nightlight which can be turned on in the bathroom, USB and HDMI connectivity and over 30 Foxtel and free to air channels. 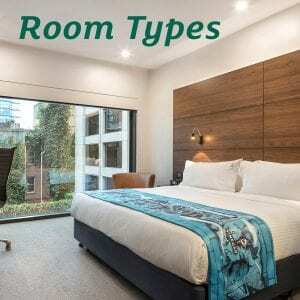 Holiday Inn Melbourne on Flinders is the ideal choice in Melbourne accommodation for those travelling for work or leisure.